What can I do to protect my property from groundwater flooding? Around 5 million people, in 2 million properties, live in flood risk areas in England and Wales alone, and in Scotland some 77,000 properties are at risk from inland flooding. Flooding normally occurs where stream, river or other drainage channels cannot cope with the amount of water that is flowing into them during periods of higher than normal rainfall, and the water breaks or overspills the banks. This is known as surface water flooding. 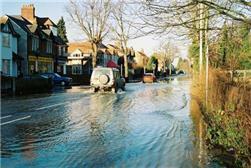 It is estimated that groundwater flooding affects a few hundred thousand properties in the UK. Groundwater flooding occurs as a result of water rising up from the underlying rocks or from water flowing from abnormal springs. This tends to occur after much longer periods of sustained high rainfall. Higher rainfall means more water will infiltrate into the ground and cause the water table to rise above normal levels. Groundwater tends to flow from areas where the ground level is high, to areas where the ground level is low. In low-lying areas the water table is usually at shallower depths anyway, but during very wet periods, with all the additional groundwater flowing towards these areas, the water table can rise up to the surface causing groundwater flooding. 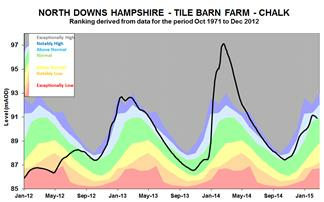 Groundwater Levels at Tile Barn Farm, a chalk borehole. Groundwater flooding is most likely to occur in low-lying areas underlain by permeable rocks (aquifers). These may be extensive, regional aquifers, such as Chalk or sandstone, or may be localised sands or river gravels in valley bottoms underlain by less permeable rocks. Groundwater flooding takes longer to dissipate because groundwater moves much more slowly than surface water and will take time to flow away underground. Groundwater flooding in the winter of 2013 and 2014 caused disruption to home, utility and infrastructure owners and affected whole communities. The Environment Agency groundwater level data illustrates how extreme this event was. The precautions that can be taken by local authorities or the environment regulators to protect against groundwater flooding are limited. 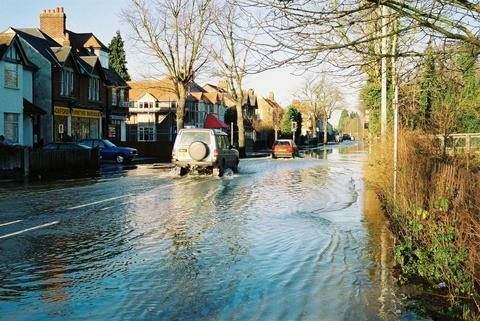 Groundwater flooding is often more difficult to prevent than surface water flooding; its not as simple as building flood defences to prevent river water spilling over its banks. There are some areas where groundwater flooding has been dealt with by installing pumps to remove groundwater and so lower the water table but these only have a localised effect, and there is still the problem of having somewhere to discharge the water. For property owners, the precautions that can be taken against groundwater flooding specifically are also limited. If you have a basement which is frequently flooded and you would like to use it for storage or as a living area, it may be possible to ‘tank’ it. This involves sealing the basement with a water-proof membrane. The Environment Agency in England and Wales has issued a pamphlet which explains these and other measures that can be taken. Given that areas prone to groundwater flooding are normally also prone to surface water flooding, measures commonly discussed for surface water flooding are also relevant. 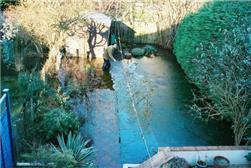 The distinction between surface water flooding and groundwater flooding is rarely clear. Increased infiltration and a rise in the water table may result in more water flowing into rivers which may then be more likely to break their banks. A rise in the water table during periods of higher than normal rainfall may mean that land drainage networks, such as storm sewers, don’t work properly if groundwater is flowing into them underground. This may affect their ability to get rid of surface water which then causes flooding. Information on how to prepare for and cope with surface water flooding and also on areas prone to this type of flooding are available on the Environment Agency and Scottish Environment Protection Agency web sites. They also issue flood warnings that are updated every 15 minutes on their webpages. A 24-hour Floodline telephone information service is also operated by the Environment Agency in England and Wales and by the Scottish Environment Protection Agency in Scotland. The number for this is 0345 988 1188. If you are concerned about flooding and would like more detailed information, you can also contact the local office of your environment regulator or your local authority. Your local library may hold records of historical flood events for your area as may the Chronology of British Hydrological Events web site.